As Joe Strummer sang on a live version of "Capital Radio", "I wanna hear Sam the Sham and the Pharaohs. Not Sham 69, Sam the Sham. Hecklerspray's Chris Laverty's sayin' the same thing, basically. He doesn't wanna play Uno. He doesn't wanna eat at Pizzeria Uno. 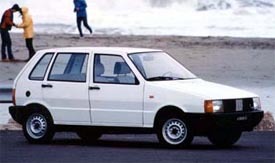 He wants a goddamn Fiat Uno Mk1, and wants you to want one, too. He's even personally crash-tested an example of the car! The kicker? "So long as you do not mind looking like an in-the-know student, the Uno is as sensible a buy as Robert Redford memorabilia."